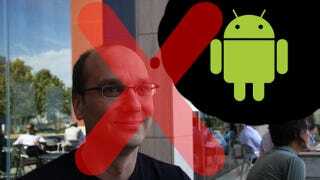 Google has announced that Android chief Andy Rubin is stepping down, and will be replaced by Sundar Pichai. Pichai is currently VP of Chrome and Apps. This is a pretty monumental shakeup. Rubin had been with Google since Android was acquired in 2005. We don't know what Rubin's going to be up to, but Google's statement from CEO Larry Page says, "Andy's decided it's time to hand over the reins and start a new chapter at Google." Presumably, that means that Rubin will be working on some new project—Glass is a natural speculation that will pop up, but is totally unfounded for now—and still around as a big brain in Mountain View. Sundar Pichai's ascendence to lead Android after Chrome's rise to dominance makes some sense, especially with Google's recent push to make Chrome OS legitimate with the Chromebook Pixel. Tighter integration between core Google products like Chrome, Android, Drive, and other apps is a pretty natural and promising thing to shoot for, and could be in the works here. What does this mean for Android itself? We don't know. Probably nothing too major in the near term. Rubin is leaving the cupboards pretty stocked, with Jelly Bean 4.2 being the most roundly praised version of Android ever, the Play Store in better shape apps-wise than it's ever been, and a bunch of nice hardware coming from partners like Samsung and HTC. If there was ever a time for a graceful exit, this was probably it. If anything, Rubin moving to another project at Google—assuming he's actually sticking around and that "new chapter at Google" isn't corporate talk for a polite exit—might be a good thing for Android going forward. Rubin has incubated Android to the point where it's both dominant and good, and can presumably carry knowledge of how to make other Google stuff work properly with the mobile OS to whatever project he ends up working on.